https://www.idmp1.com has started the first terminology browser for health professionals in the eSubmission of medicinal products – named the IDMP Term Browser. Furthermore under https://www.idmp1.com you will find a free IDMP Wiki and other solutions to IDMP. The IDMP Term Browser includes terminology of the eXtended Eudravigilance Medicinal Product Dictionary (XEVMPD) and of the Identification of Medicinal Products (IDMP) which is required by the European Medicines Agency (EMA) for the Electronic Submission of Medicinal Product Information in the EU (eSubmission) between regulators and pharmaceutical companies. Furthermore it is most likely that the Food and Drug Administration (FDA) will take over this IDMP Standard in the near future. So the FDA´s “Structured Product Labeling” (SPL) Terminology also is integrated in the IDMP Term Browser. What is the legal base for IDMP? The Implementation of Electronic Submission of Medicinal Product Information in the EU (Article 57(2) Requirements of the New Pharmacovigilance Legislation). 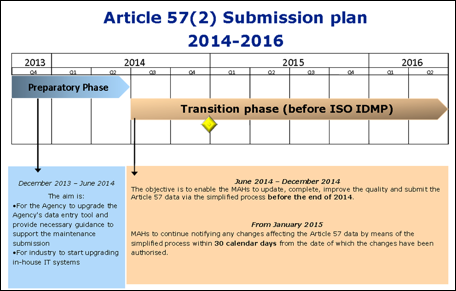 IDMP will become mandatory latest by 1st July 2016.
Who is affected by IDMP? Current regulations in the US and Europe require substantially different technologies, terminologies and vocabularies for registration of medicinal products. In the US, the FDA requires a “Structured Product Labeling” (SPL). In Europe, the European Medical Agency (EMA) initiated a new standard called IDentification of Medicinal Products (IDMP). It is most likely that FDA will take-over these standards in near future. IDMP raised the bar significantly by requiring information be sent in specific form for each country and language and coded with an ISO Code. In order to submit the data all branches of a company should share a common language, from pharmacovigilance to product supply to comply with the controlled vocabulary dedicated. 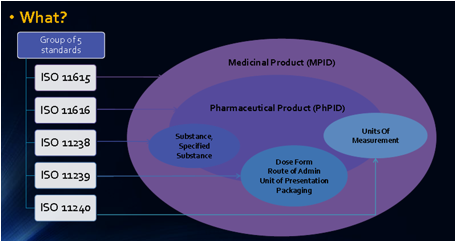 The structured substance information, and controlled vocabularies for pharmaceutical dose forms, units of presentation, routes of administration, and packaging will be challenging to integrate. The official standard term lists controlled vocabularies is maintained either by EMA or by external maintenance organisation. The use of this CVs is today in XEVMPD on a voluntary base for certain areas but will become mandatory with IDMP latest by 1st July 2016. In some areas it is not yet decided which vocabulary EMA might require. However EMA agreed on the components of Identification IDMP. The European Medicines Agency’s commitment to meeting the 16 July 2016 legislative deadline for implementing the Identification of Medicinal Products (IDMP) —has created disquiet in the regulatory community. Companies know that the IDMP is a far broader set of standards than the eXtended EudraVigilance Medicinal Product Dictionary (XEVMPD), which it replaces. And given the problems companies have faced in preparing to meet the XEVMPD, their concerns are understandable. The good news, however, is that even though the IDMP will require significant time and resource commitments, it is better designed than the XEVMPD; and because it eases the exchange of data by means of standardisation, it also presents an opportunity for companies to improve their own regulatory information management (RIM). The IDMP Term Browser is keeping its finger on the pulse of developments around XEVMPD and the IDMP controlled vocabularies and the related coding issues. Our experience with helping other industries adapt their terminology to such controlled vocabulary has given us a deeper level of insight into helping you leap from worry to successful adaptation. To learn more, see the [pharmazie.com] Web site on IDMP. The IDMP Browser helps make your coding projects a success. The standard route of administration controlled vocabulary is populated and maintained by EMA. The XEVMPD value is the EDQM standard term value whilst the unique identifiers (i.e. EV Codes) are randomly and automatically assigned by the EV system upon request. The values and codes of the above lists are published and maintained by the Unified Code for Units of Measure (UCUM) and are freely available at http://unitsofmeasure.org/. ISO 11240 describes the SI (International System) of units, and creates data structures for communicating values and units for electronic messaging. Distinct in the ISO 11240 methodology is splitting the unit type (e.g. “grams”) from the scale (e.g. “milli”), so instead of just measuring in “mg”, the standard specifies “M” and “G” as separate terms. Following the validation performed by the Agency to provide high quality Article 57(2) data, the XEVMPD substance controlled vocabulary contains the complete list of the substance assessment and mapping data. Specifically, the purpose of this data is to allow Marketing Authorisation Holders (MAHs) submitting Article 57 medicinal product information via EMA Gateway to perform an analysis and plan for the implementation of the remapping of substance names in their in-house systems. In addition, the actions to be performed by EVWEB users (where applicable) are also explained. Official reference sources for substance names, synonyms and translations. 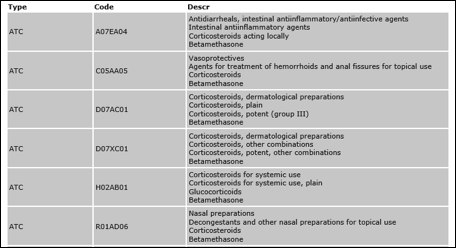 The ATC list is published and maintained by the WHO Collaborating Centre for Drug Statistics Methodology. Summary of changes for each ATC version are published by WHO. 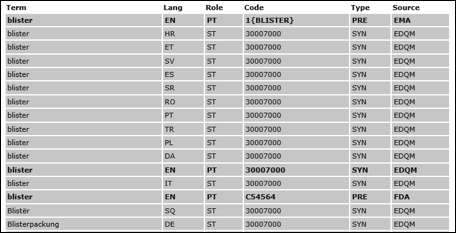 In addition to the ATC standard term list, the values “NOTASSIGN” and “NOTAPPLIC” were added to the official list to allow the selection of such values when the ATC code is not assigned or not applicable to the authorised/registered medicinal product. The Country Code is maintained by ISO (ISO-3166). The Two-Letter Language Code is maintained by ISO (ISO 639-1). UUnique Ingredient Identifier - a non-proprietary, free, unique, unambiguous, nonsemantic, alphanumeric identifier based on a substance’s molecular structure and/or descriptive information. The FDA requires a “Stuctured Product Labeling” (SPL) for the registration of medicinal products. The substances are to be coded by a UNII code. The Medical Dictionary for Regulatory Activities Terminology (MedDRA) is an international standard terminology used to classify adverse event information and indications associated with the use of biopharmaceuticals and other medical products. In some areas it is not yet decided which vocabulary EMA might require e.g. for indications and adverse reactions but MedDRA is one of the candidates for this purpose (besides SNOMED CT see below). MedDRA was developed under the auspices of the International Conference on Harmonization of Technical Requirements for Registration of Pharmaceuticals for Human Use (ICH). The International Federation of Pharmaceutical Manufacturers and Associations (IFPMA) owns MedDRA as trustee for ICH, and the Maintenance and Support Services Organization (MSSO) serves as the repository, maintainer, and distributor. MedDRA is updated bi-annually (March and September). As MedDRA requires a specific license and is not yet required, it is not integrated in the IDMP Term Browser. Systematized Nomenclature of Medicine-Clinical Terms (SNOMED CT) provides core general terminology for the electronic health record (EHR). Concepts have unique meanings and formal logic-based definitions organized into hierarchies. Each international release includes the core of the terminology (concepts, descriptions, and relationships), together with resources to support the implementation and use of SNOMED CT, including subsets, cross maps to existing classifications and coding schemes, and an extensive set of guidelines. SNOMED CT includes more than 311,000 unique concepts. There are almost 800,000 descriptions in SNOMED CT, including synonyms that can be used to refer to a concept. In addition, there are approximately 1,360,000 links or semantic relationships between the SNOMED CT concepts. 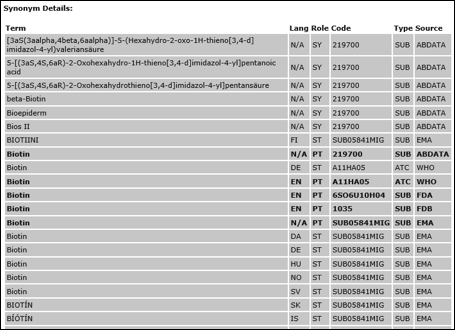 SNOMED is FDA´s favourite to be used to code indications and adverse reactions in IDMP (instead of MedDRA). But up to now it is not yet decided and discussions are going on. The International Substance List includes data on more than 40,000 ingredients and plants with more than 65,000 synonyms and more than 150,000 drugs in 54 countries.